Perhaps you could start by explaining a little more about the job of a stunt double in a show like Kamen Rider. The job of a stunt double on a show like Kamen Rider is to not only keep the actors safe; but to add some skill that the actors either don't have or to match a skill that the actors are unavailable to do because they may be shooting on a different unit simultaneously. Some skills for this show include Martial Arts, Gymnastics, Wire Work, and Motorcycle Riding to name a few. The stunt doubles learn extensive fight choreography that incorporates weapons, and requires agility for climbing, jumping, breaking through walls, falling, flipping, evading, and doing it all in a graceful effortless-looking manner. You’re credited as being a stunt double for Siren. Does that mean you got to wear the Kamen Rider armour? Yes, I did get to wear the Kamen Rider aromour for the Siren character. It was a blast; and adds such a degree of pride knowing that not many people get to wear the armour. And somehow when the full wardrobe is on, the characters' style, and essence comes to life! 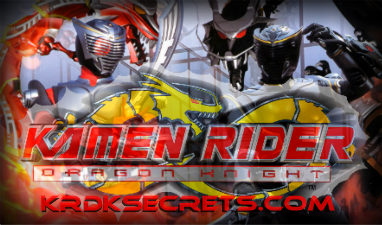 What was the best thing about working on Kamen Rider Dragon Knight? For me, there were so many wonderful things about working on Kamen Rider Dragon Knight. It's really hard to pick a favorite so I'll list the things that come to mind. Getting to work with such a dedicated, honorable group of individuals coming together to share their respective talents with such integrity was an absolute delight. The stunt coordinator, Dorenda Moore, is not only a friend of mine, but an extremely knowledgeable and talented stuntwoman/stunt coordinator. I always knew that it was a safe set on her watch. It was always amazing to me to learn a fight scene from Yuji Noguchi of Alpha Stunts who was the Action Director and Fight Choreographer. He is an unbelievably skilled martial artist. He's quick, flexible, strong and I swear he must have springs in his legs. I was always impressed and inspired when working with Yuji. There was never a dull moment on Kamen RIder. Even with 16 years of stuntwork under my belt, I was constantly learning and doing new things on the show. I was fortunate to get to work with such creative people. You’ve done stunts on some big name projects. Do you have a favourite of the shows and films you’ve worked on? I can honestly say that I could never choose a "favorite" show or film. Each and every single stunt job has been unique and appreciated. That's what I love about this business: there is no monotony. I get to come to work and play! As a double, does it bother you that people see the main actress instead of you? It doesn't bother me at all that people see the actress instead of me. That's just part of the job. I'm always grateful for work, we get paid really well for what we do, and I've been in the other position as well. I actually had a stunt double for an acting job that I booked. It was a little strange not doing my own stunts; but I got to appreciate the other perspective. Did you always want to do stunt work? As soon as I realized that stunt work was even an option, I knew it was for me. I was a competitive gymnast for 10 years and when the time came to retire, it really saddened me because it was such a part of my identity and my soul's fulfillment. I knew I wanted to continue to perform so I got a manager and started doing commercials. The 1st few jobs I did were stunt doubling and I didn't even know it going into it. I just went to the audition, did a few flips and got the jobs. It wasn't until I was on set and filled out my contracts that I saw the words "Stunt Double" and what a pleasant surprise it was to have fallen into a career so perfect for me! You say that you did a lot of different work on the show. Is there a particular aspect you like best? I love fight scenes the best. The stunt coordinator and fight choreographer always come up with the coolest moves. Having a dance background as well, I compare it to learning and executing a dance. You have to be on the same page as your "opponent/partner" and drama ensues. It's exhilarating! You said you’ve done a lot of gymnastics but had you done much martial arts training? I started training in Martial Arts when I was 19 years old. I got cast as the Pink Power Ranger for Saban's World Tour and they had a wonderful instructor for us named Moritaka Yoshida. I loved the process and it came quite naturally (for the most part) for me given my dance/gymnastics background. However, I was terribly sore for a while learning to focus on using a different set of muscles due to the fact that in dance and gymnastics we're supposed to "turn out" (legs) and "point" our toes/feet; and in martial arts, a great deal of it was "turning in" (legs) and "flexing" (feet). The flexibility and strength work helped a great deal...and I got to learn a new skill which I'd come to use in most of my work. For that I'm so grateful. The fans are what it's all about! We have no show without them. What a great feeling it is to be a part of something bigger than yourself and that so many people are excited about.